Whispers of Birmingham’s bustling past used to blanket downtown. Abandoned storefronts, rusted signs and silenced blast furnaces pointed to a time when the Magic City attracted growth and opportunity. Now, those whispers have turned into an audible conversation loud enough to build parks, move ballfields, reclaim high-rises and put Birmingham back on the map. What was once considered a “ghost town” has turned into a growing, thriving city. For Birmingham’s biggest advocates — the ones who believed in it years before the breweries moved in and cobwebbed theaters turned their lights back on — downtown’s renaissance is no coincidence. It’s the result of dreaming big and putting in the legwork to see those dreams become reality. If you ask Deon Gordon, Executive Director of TechBirmingham and former Director of Business Growth at REV Birmingham, the Magic City shouldn’t have survived the collapse of the steel industry or recovered from its infamous reputation as the racist underbelly of the South. Despite its troubled past, however, Birmingham persists, he says. The Pizitz Food Hall houses a plethora of food stalls and two restaurants with culinary flavors from around the globe. Supported by REV Birmingham and their CO.STARTERS platform, the REVeal Kitchen will serve as an incubator for the Magic City’s emerging culinary creatives. REV, which has been a key player in catalyzing business development in the downtown area, traces its roots back to about 1957 with the development of Operation New Birmingham. Through the years, the organization had a few title changes and shifted visions to focus on commercial development. Eventually the agency merged with a few others, and REV was born in 2012. Through programs like The Big Pitch (a business pitch competition for local startups) and Urban Food Project, which works to bring locally sourced produce to Birmingham, entrepreneurs have been able to fuel their business dreams and add to downtown’s growth, Deon says. REV’s projects can be seen throughout downtown. From Zyp BikeShare to the now-iconic red Eugene’s Hot Chicken truck, the organization is making sure Birmingham’s momentum keeps rolling. Homegrown local hot chicken genius Zebbie Carney whips up chicken and sides so good, parking lots of long lines are a regular occurrence for Eugene’s Hot Chicken, his booming business. 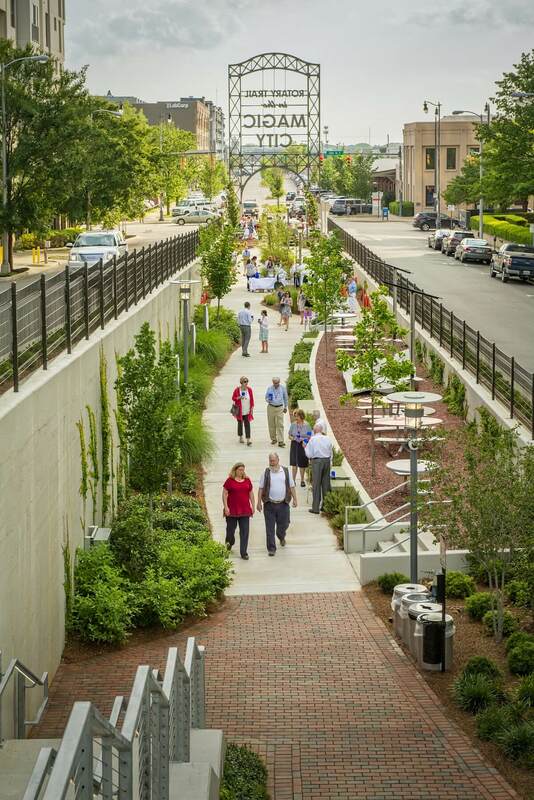 When considering some of Birmingham’s biggest achievements in the last decade, Deon points to Railroad Park, an idea born out of the desire to bring more green space to downtown and attract business. Railroad Park, which cost $17 million (a steal, Deon says), was completed in September 2010 thanks to a massive fundraising project. Since then, the park has grown to become a hub for community events like Trucks by the Tracks, a summer concert series hosted by the Alabama Symphony, Brrrmingham seasonal ice skating rink and daily exercise classes. Cheryl Morgan, former director of Auburn University’s Urban Studio and a driving force behind many of Birmingham’s architectural and urban planning upgrades, was an early advocate for Railroad Park along with other projects that have shaped the city, like the revitalization of Sloss Furnaces and Red Mountain Park. Urban Studio — a branch of Auburn’s College of Architecture, Design and Construction — invites students to reimagine Birmingham’s downtown through hands-on projects. Once Railroad Park proved to be a win for the city, a strong confidence began to take hold downtown — causing a domino effect of business growth, Cheryl says. It’s the kind of thing urban planners dream of, she says. A view of downtown at dusk over the lake at Railroad Park is breathtaking. Cheryl muses if Railroad Park wouldn’t have come to fruition, the Birmingham Barons might not call downtown home today. “Back then, that was a real second vote of confidence for the revitalization of downtown,” Cheryl says of the Barons’ move from Hoover to Southside in 2013. Now with countless new businesses dotting the city and restaurateurs flocking downtown faster than anyone could imagine, Birmingham is sparking another wave of optimism and growth. Louis Nequette of Nequette Architecture & Design has championed downtown living for years. Nestled in an open studio space on Second Avenue South, his office is a visible testament to urbanization. And although his chic office quarters are nothing to scoff at, the architect has his eyes set on a few buildings across the street. As a way to keep the neighborhood growing, Nequette is redeveloping the historic Harold Furniture buildings at 2255 and 2227 Second Avenue North into luxury loft apartments along with office and retail spaces. It’s a project he hopes will add to Birmingham’s burgeoning urban scene. Nequette says residents can expect the property to attract steady traffic, adding to the existing vibrancy of Second Avenue. He also plans to rebrand the buildings as “The Thomas” — a way to pay respect to his father, who was a Marine helicopter pilot in the Vietnam War. Apartments will range from 1,400 to 2,000 square feet, featuring exposed brick walls and impressive city views. Located in the heart of the city center between First and Morris Avenues, Founders Station is set to open Spring 2018 and serve as a mixed-use condo development. Back in the early 1900s, John explains, the buildings — located on the corner of 20th Street and First Avenue — were some of the tallest in the South. Towering high over the Magic City, the corner became known as “The Heaviest Corner on Earth.” Because the buildings hold such great historic value, Boone says Orchestra plans to retain the buildings’ industrial feel. Previously known as “The Heaviest Corner on Earth,” local real estate company Orchestra Partners is working to reclaim the corner and turn it into a mixed-use urban development. Architecturally speaking, John says, Birmingham’s downtown landscape is a developer’s dream. It wasn’t hard to look downtown and see potential for growth, he says. “We want Founders Station to be a stamp of what Orchestra focuses on as a community redeveloper,” he adds. Without a doubt, John says, Birmingham is becoming a city to be reckoned with when matched up against other regional cities like Atlanta and Nashville, which have been viewed as “older siblings” for too long. And while vacant storefronts are becoming a rarity and choosing where to eat out on a Saturday night is becoming more difficult, the city’s history still beckons at every corner. And that, leaders say, is a good thing. Because Birmingham has witnessed such a great resurgence in a relatively short amount of time, a lot of the folks who helped it grow are still active in the city today. Leigh Sloss-Corra — granddaughter of Arthur Page (“Pete”) Sloss, who pioneered Sloss Real Estate — is one of them. Leigh can recall when her sister, Catherine (“Cathy”) Sloss Jones, wearing a worn pair of overalls and having nothing but ambition in her eyes, sized up a vacant lot near the old Dr. Pepper Bottling Company a couple decades ago and decided it would make a great place for a farmers’ market. “It doesn’t seem like that long ago,” says Leigh, who now serves as executive director of The Market at Pepper Place, a nationally acclaimed farmers’ market and one of Birmingham’s most notable Saturday markets that attracts countless artisans and farmers from throughout the state. You can now join Friends of the Market, a nonprofit 501(c)(3), and help The Market at Pepper Place continue to be the vibrant gathering place it has become over the last 17 years. Leigh is quick to point out, however, that if you rewind back a few decades, there were only a handful of people who were “dreaming big” for Birmingham. Thanks to those folks, she says, Birmingham is brimming with vibrancy and potential today. Want the best of everything Southern? Subscribe to StyleBlueprint. It’s FREE!